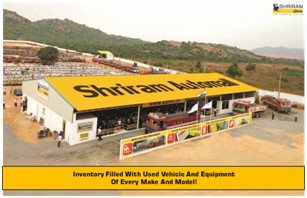 Why Shriram Automall for Used Vehicles and Equipment in India? Shriram Automall India Limited(SAMIL) – The No.1 Choice for used vehicle and equipment transactions in the country is a company that offers multiple bidding platforms to bid and acquire used vehicles or equipment of every make and model. SAMIL’s online bidding facility is one such method of acquiring pre owned vehicles and equipment, which is now quite famous amongst the younger generation of our society. A pre-owned vehicle, in most parts of the India, satisfies one of the most important family aspirations — affordability. Though affordability is a big reason but it may not be the only one. Many people go to acquire pre-owned vehicles because they offer value for money. Thereby while realizing the demand of used vehicles and equipment in the country, SAMIL as a company came into existence in 2011. Since then layer by layer company has organized the most unorganized used automotive transaction industry of the Nation, making the process easy, convenient and trustworthy for its customers. Through all the services and easily accessible, innovative platforms that company provides for its customers, SAMIL has proved that rather than dreaming of success, company knows how to wake up and work hard for it while providing the most user friendly environment of all time for their customers. Hence, in a very short span of 6years, company has successfully created, over 6.5lakh customer base & has also become their no.1 choice. With an aim to reach out to every customer’s used vehicle and equipment requirement in the country, company has successfully established 70+ Automall facilities and 150+ bidding locations in every major and minor city of India. Customers from anywhere in the country can take benefit of the Automall facility and services it provide by conveniently acquiring or disposing the desired used vehicle at optimal prices. SAMIL being the only company that offers Power of Choice, Reliability and transparency through the most organized platforms of all time. So what are you waiting for? If looking to acquire or dispose used vehicle and equipment, visit the nearby Automall and experience the most innovative services that company offers. You can also click the link below to register yourself or download MySAMIL App.